Since the first edition was published, there has been a surge of interest in stochastic partial differential equations (PDEs) driven by the Lévy type of noise. 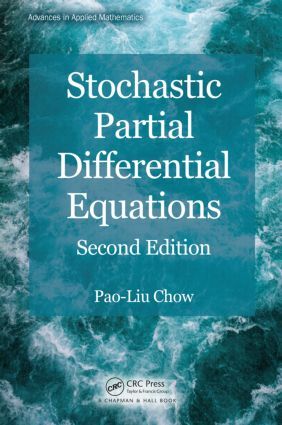 Stochastic Partial Differential Equations, Second Edition incorporates these recent developments and improves the presentation of material. The book covers basic theory as well as computational and analytical techniques to solve physical, biological, and financial problems. It first presents classical concrete problems before proceeding to a unified theory of stochastic evolution equations and describing applications, such as turbulence in fluid dynamics, a spatial population growth model in a random environment, and a stochastic model in bond market theory. The author also explores the connection of stochastic PDEs to infinite-dimensional stochastic analysis. "This is the second edition of the very well-written and introductory, application-oriented book on stochastic partial differential equations (SPDEs) by P.L. Chow. Compared to the first edition, the main change is adding new materials about SPDEs driven by Lévy-type noise." "The book provides an excellent introduction to the theory of stochastic partial differential equations … a well-written and timely contribution to the literature." "… an excellent guide to current research topics that opens possibilities for further developments in the field." "This introductory book fills a gap in the field." "… very well-written introductory book … I thoroughly recommend this book and believe that it will be a useful textbook with which to introduce students and young scientists to computational and analytical techniques for stochastic differential equations. This book is of great interest to applied mathematicians, theoretical physicists, naturalists, and all interested in the statistical formulation of scientific problems."